WINTER IS THE GREATEST HORROR STORY OF THEM ALL! Sean Chiller is a cop on vacation with his wife and three-year-old daughter when they become trapped in a strange little town by a killer storm. They soon discover the secret colony is the center of a genetics experiment gone horribly wrong; a major corporate research center for GMO foods where the local residents are the guinea pigs, mutating into rampaging monsters, slaves to the town’s sociopathic physician, the Mayor, and the county Sheriff. With the help of one eccentric local they plan a bold escape the townies will do anything to stop. Anything. JOIN OUR READERS CLUB! Get a FREE full-length novel and MEMBERS ONLY copy of CRISPY CRITTERS 2 when it’s released in the fall. Just click on the button below! The aboriginal people of Northern Norway, Sweden and Finland (the Saami) have over 200 words for snow – the quality and quantity of snow and how it’s used in everyday hunting and foraging. They would have created more if they drove cars, had their flights to Bermuda canceled due to bad weather, or wore high heels in a snowstorm. Sean Chiller, the hero of our story, has only one word for snow – which cannot be repeated in front of his three-year-old daughter. Just after five in the evening, about 30 miles south of Grand Forks, the wind started to pick up and push fingers of snow across the highway. Sean Chiller switched over to four-wheel-drive not long after, the sky growing darker and the temperature dropping. Visibility turned poor. He felt like he was driving through cream of wheat. His wife Tracy, true to form, had her iPhone on her knee, checking the weather. Tracy looked back over her shoulder. Her daughter was sleeping in the back seat of the Explorer, her car seat crowded with her favorite stuffed monkey, a miniature plastic guitar, and a soggy half eaten biscuit. “How much longer to Fargo?” she asked, considering his question. “Normally an hour or so. But at this rate we won’t get there until nine. But if we turn around, I’m betting during this time of year, there won’t be a room left at the Inn.” It happened before to them once a few years ago. Same time of year. Tomorrow was Black Friday, the biggest shopping day of the year. They would be like homeless people in the middle of a blizzard. Sean imagined them sleeping in the car. “I haven’t seen one other vehicle on the road,” said Tracy. “Would you go out in this kind of weather if you didn’t have to?” Sean’s daughter had a rare genetic disease, a variation of Cystic Fibrosis or CF. Weekly injections were required to keep her alive. They had a meeting with a specialist at the Genetics Transfer Clinic in Fargo and a ray of hope for a partial cure based on genetic therapy. It was a long shot, but worth the expense. Sean was a Corporal with the Royal Canadian Mounted Police in Winnipeg, where they lived about four hours north of their present position. They were taking an extended holiday to meet with a specialist, and if they were lucky, get in some Christmas shopping. Sean craned his neck, the blowing snow making the shoulders of the road indistinct and uncertain. The road ahead had narrowed into a tunnel of icy pavement and howling wind. In some spots the road was covered over by so much white stuff the location of the center line became a complete mystery. Shallow depressions on each side of the highway indicating ditches quickly filling with snow, the only landmarks Sean could use to stay on the road. His dropped his speed to thirty. Then out of the blurry swirl of snow and ice pellets ahead of them, he saw a bright flash of movement rise up from the roadbed as some whirling shape caught the light from his headlights. Sean jumped. It was like seeing a ghost coming out of the nowhere. Then they both heard a crunching sound emanating from the front of the SUV. They struck something solid. A spooky rhythmic beating sound followed. Sean slowed to a stop, squinting out into the night. The collision sent a shock through him. He could feel the hairs on his neck and arms standing up. Something had risen off the road and struck their SUV, but Sean could only make out a blurry shape moving just out of their sight below the hood. He looked over at Trace, hunched over in her seat. “It scared the poop out of me,” she said. “It sounded pretty big.” They both saw the flash of white again, like a ghostly hand waving at them and then disappearing below the headlights. Sean felt another chill. He looked back at his daughter. She was still sleeping soundly, thank God. He turned to Trace, then dropped the gear shift into reverse. He backed up slowly, the snow like corn starch crunching under the tires. Whatever had disturbed the drift in front of the Explorer was now blown smooth by the wind. There was nothing to be seen. And no tracks. Trace jumped and swore. “What the hell? Where is it? Under the car?” She twisted around and checked the door locks to make sure they were engaged. She peered into the side mirror, the window so caked with snow she could barely make out anything outside. “I can’t see a damned thing,” she said. Sean backed up few more feet, aware now that the snow was getting heavier, and the highway ahead now looked like a frozen featureless landscape. “I’m going to go check,” said Sean, not feeling nearly as brave and purposeful as he sounded. He was using his police officer voice. Of course, Trace would see through that in a second. So it was only for his benefit. Sean grabbed the latch and cracked his door open, looking back behind the vehicle. There was a vague reddish glow coming from the rear, the running lights reflecting off a billion vicious ice crystals and snowflakes, eddying like mad around the rear of the SUV. It didn’t look friendly out there. Mother nature was pissed or just playing with them. Sean stepped down onto the crown of the highway, shocked by the depth of the snow. Up past the hem of his blue jeans, the snow immediately seeped into his shoes and around his ankles. He squinted into the wind, visibility now only a few yards. He shut the door and pushed his way to the front of the Explorer. He could see something lodged in the grill. A moving object about the size of a small dog and struggling frantically. He shuffled closer, then jumped back. A wing about two feet long lashed out at him, but the wind caught the edge and pushed it back against the grill. Sean could make out a head, black eyes, and a curved beak. It was a bird, lodged in the front of his truck. He could see that some of the front grill plastic was broken and was digging into the animal’s side. There were traces of blood, but the bird was still very much alive. Sean moved closer, and the head flinched and the bird opened its beak. Sean stood there, the glare of the headlights blinding him. It was an owl. The eyes were huge. Sean could see it rotating its head the way owls do. He reached across with one gloved hand and the owl immediately attacked with both claws. Sean pulled back, realizing there was no way to get close enough to pry the bird out without having his arms shredded. The plastic grill had split when the bird struck and then closed around its chest again, holding the owl in an inhumane vice. Sean trudged back to his door and climbed inside. “What kind of owl?” Trace looked like she was about to cry. Sean shrugged. “Look it up.” Trace took her phone from the center console cup holder and tapped the web browser. “Is it suffering?” she asked. “Poor thing,” Trace said, her head down, looking at more pictures of snowy owls. Sean put the SUV in gear. As soon as he accelerated, one wing flashed up and banged on the hood. Trace flinched, and Sean swallowed hard. This was going to be a long drive. If his mother were here, she’d say this was an omen. Like the Gods had sent a message to Sean regarding his uncertain future. An email would have been more humane. Now they were going to have to witness every last dying effort of the owl as they crawled down a road that looked more like a vast snow-covered cow pasture. He looked at the GPS. Two more miles to go on this highway and then they could turn right. Then he looked at the gas gauge and his stomach clenched. They were on empty. How did they get to empty so fast? They filled up that morning in Winnipeg. They should have a half a tank left. He looked at the GPS again, willing the screen to zoom through the two miles as quickly as possible, their four-wheel-drive SUV apparently burning gas faster than a Greyhound bus. And where was the closest gas station? He could use the GPS to check that out, but didn’t want to waste any more time. “How’s Ash?” he asked, not willing to take his eyes off the road for even a second. “Five o’clock,” thought Sean. At this rate, we’ll be sitting at the side of the road, out of gas, covered in a mountain of snow by that point. “Turn right in half a mile,” said the GPS. “Are you OK?” Tracy leaned toward him, but Sean was more worried she would see the gas gauge. She rubbed his neck, then stopped when the owls wing flew up again and thrashed at the hood. “Mommy. Where are we?” asked Ashley, her voice sleepy and uncertain.They were both well acquainted with three-year-olds and their great sense of timing. “Half a mile from a plowed road,” said Sean, thinking out loud. That’s the way he imagined it. A super highway cleaned right down to the blacktop, dotted with brightly lit gas stations and maybe a nice clean Ramada so they could get out of this storm. 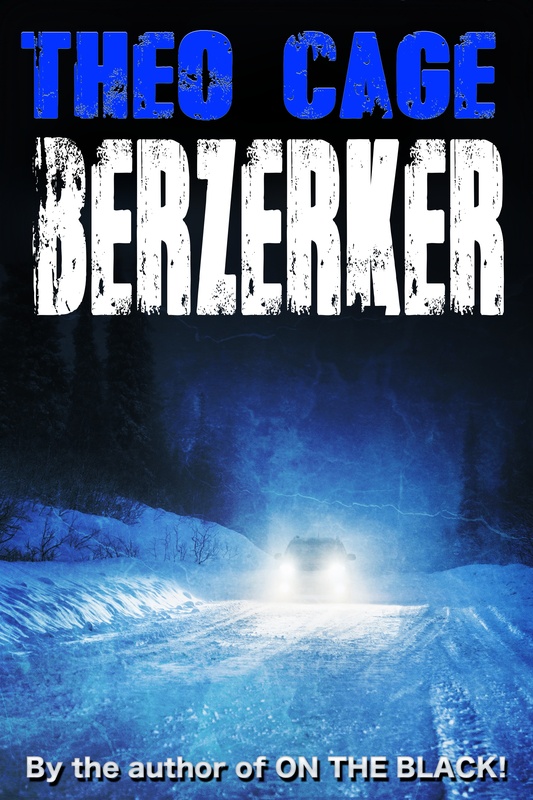 I just received a copy of Berzerkers from LibraryThing. I have started it, and it is gripping. Love the main characters, and keep going back to read as soon as I can. Found a couple of spelling and sentence booboos, but really am enjoying it so far. I have already chatted it up on Facebook and have several people who want to read it. Read this in two days, well paced and engaging. Russ, good to see you engaged in writting. I always thought you would pen songs as you had the touch. happy Trails g.